Lancaster City have secured the services of Sam and Charlie Bailey for another season. The brothers, born in the city, both played their part in the Dolly Blues’ first year in the Evo-Stik Premier Division in 2017-18. The midfielders have now joined left back Paul Dugdale in putting pen to paper at Giant Axe for the coming campaign. Sam made 42 appearances and scored eight goals last term having arrived from Kendal Town 12 months ago. “Sam’s proved to be an excellent signing for us,” said City boss Phil Brown. “He performed very well last season and I am really pleased he’s signed for the forthcoming season. Charlie, a former Morecambe professional, followed his brother from Kendal to Lancaster last summer, going on to score five goals in 31 appearances of his own. “Charlie’s an excellent player and we are really pleased to have agreed terms with him for next season,” Brown said. “Charlie showed last season the quality he has. He’s an excellent footballer. The Blues have already seen plenty of comings and goings this season with midfielders Craig Carney and Billy Akrigg both departing Giant Axe. Akrigg, a long-serving Blues player formerly of Slyne-with-Hest, looks set to sign for divisional rival Stalybridge Celtic. 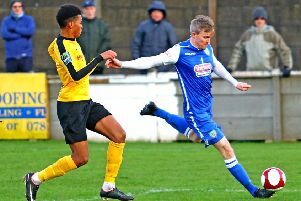 Carney has completed a move to another Premier Division side in Marine. “Players go and new ones come in, it’s what happens across all levels of football,” said Brown. “Craig received an attractive offer from Marine and has decided to take it. “With regards to Craig’s position we are lucky to have several good players who can play in there, it’s now their time.